What's your favorite cushion makeup? I have been on the hunt for the perfect cushion and I'll be honest, I haven't found it yet. I have found a few that I like but none of them are the perfect, I-would-buy-this-forever type of cushion. So my hunt continues. 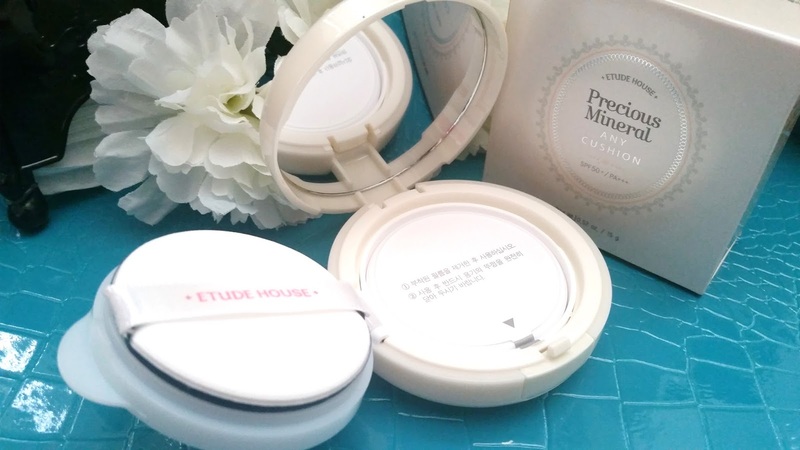 During my journey of finding the perfect cushion, I decided to try out Etude House's Precious Mineral Moist Any Cushion. (Man, Asian beauty products and their long names, seriously.) The Precious Mineral Moist Any Cushion is a cushion that a lot of people likes and it is budget friendly, so I thought why not. Aside from the Moist cushion, Etude House also have the regular version, the Magic version and the new Pearl Aura version. I decided to purchase the Moist version because I wanted to try out their moisturizing cushion and compare it to Innisfree's Ampoule Intense cushion. Anyways, let's get to know this Precious Mineral Moist Any Cushion. 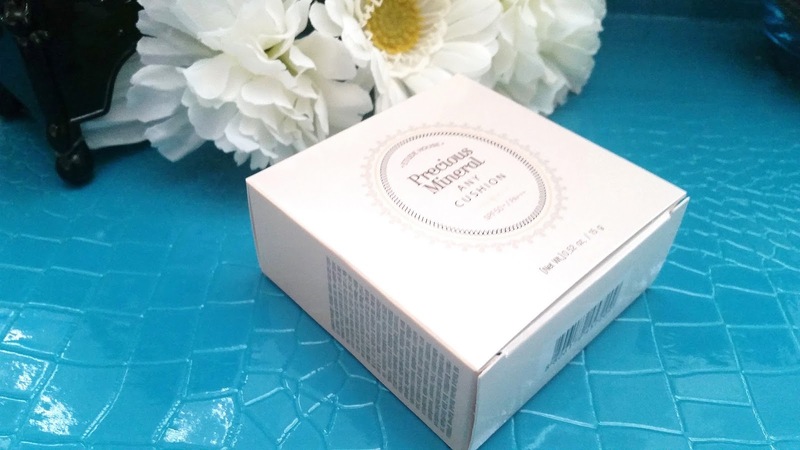 Product Description: A multitasking cushion to provide a flawless complexion that's rich with moisturizing properties. It's formulated with 26.7% Baobab water and hyaluronic acid to provide the skin with intense hydration throughout the day. 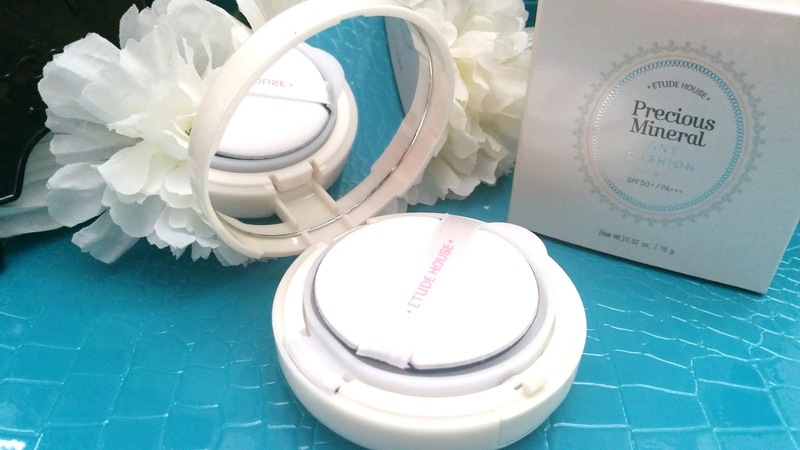 The cushion is a 6 in 1 product with moisturizing effects, brightening effects, anti-aging effects, UV protection (SPF 50+ PA+++), tone correcting properties, and provides a glowy finish. To Use: Take the puff provided with the cushion and dab lightly into the sponge to pick up an adequate amount of BB cream. Pat lightly all over the face for an even application. Ingredients: ADANSONIA DIGITATA FRUIT EXTRACT, CYCLOPENTASILOXANE, ZINC OXIDE (CI 77947), TITANIUM DIOXIDE (CI 77891), ETHYLHEXYL METHOXYCINNAMATE, BUTYLENE GLYCOL, CYCLOHEXASILOXANE, PHENYL TRIMETHICONE, PEG-10 DIMETHICONE, WATER, BUTYLENE GLYCOL DICAPRYLATE/DICAPRATE, CETYL ETHYLHEXANOATE, NIACINAMIDE, LAURYL PEG-8 DIMETHICONE, GLYCERIN, DISODIUM EDTA, DISTEARDIMONIUM HECTORITE, METHYL METHACRYLATE CROSSPOLYMER, SODIUM CHLORIDE, SODIUM HYALURONATE, STEARIC ACID, ADENOSINE, ACRYLATES/ETHYLHEXYL ACRYLATE/DIMETHICONE METHACRYLATE COPOLYMER, ALUMINUM HYDROXIDE, ETHYLHEXYLGLYCERIN, ALCOHOL, MOTHER OF PEARL, CAPRYLYL GLYCOL, TRIETHOXYCAPRYLYLSILANE, PHENOXYETHANOL, IRON OXIDES (CI 77492), IRON OXIDES (CI 77491), IRON OXIDES (CI 77499), FRAGRANCE. 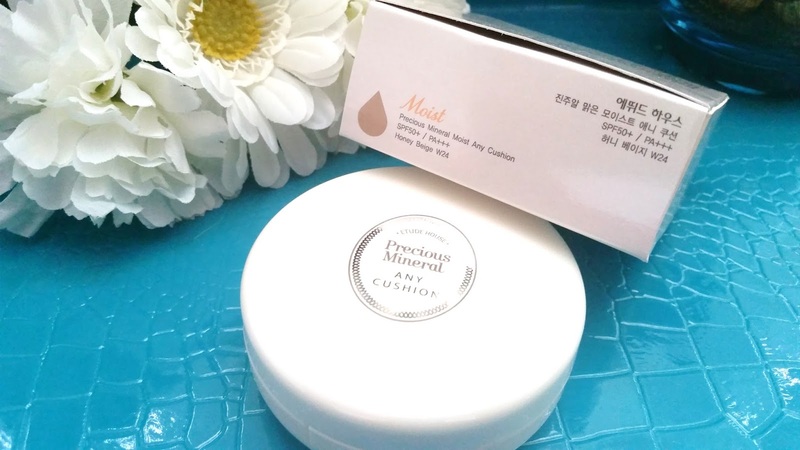 Packaging: The Precious Mineral Moist Any cushion's packaging looks just like most cushions. The same round container with a mirror inside, a separate section for the puff, and finally the sponge containing the BB cream. 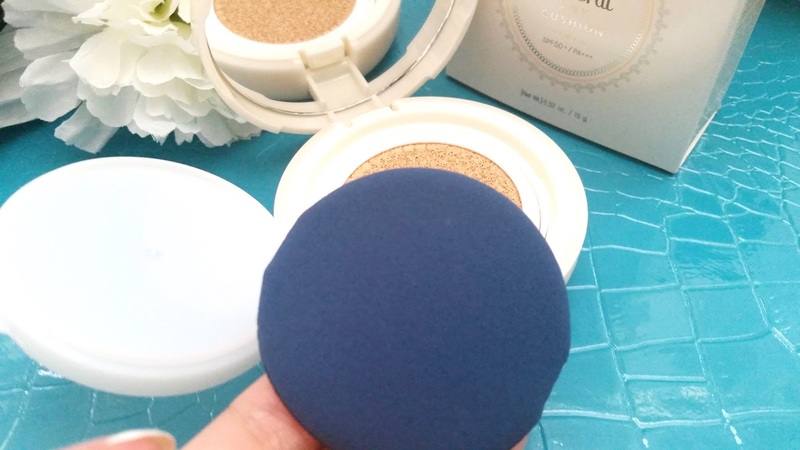 I would say this cushion compact is bulkier than Innisfree's cushion and a bit heavier too. However, both contains the same amount of product, so it seems, the general packaging itself is a bit heavier. The minimal design on the cushion still follows Etude House's cute princessy designs, which was expected. Scent: The cushion has a floral scent that's a bit more than mild. The floral fragrance is most likely from the added fragrance in the ingredient list. It does not smell bad for me, and I actually don't mind the fragrance. However, for people who don't like fragrances in their products, this might not be the cushion for you. 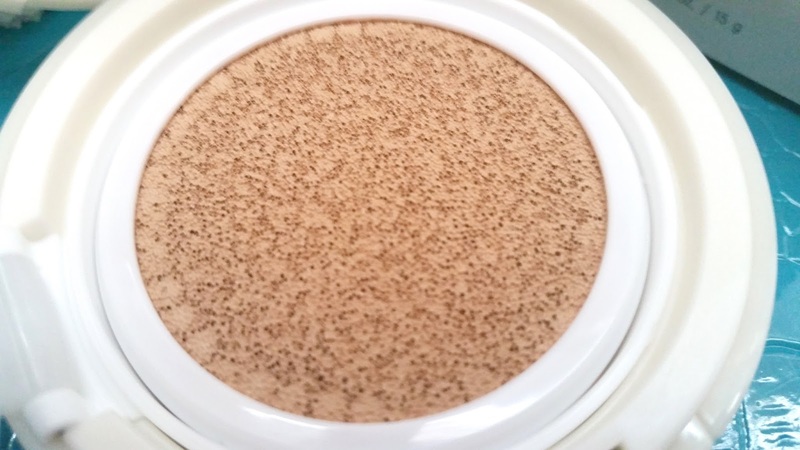 Color: The Moist cushion has 3 color choices: N02 Light Beige, W13 Natural Beige, and W24 Honey Beige. I got the W24 Honey beige color since I think the N02 and W13 would be too light for me. Compared to Innisfree's #23 shade, W24 is just a tad bit darker. However, it looked good on my skin during the summer times. Texture: The texture of this cushion felt similar to that of Innisfree's cushions. It's more liquidy than most BB creams and applies easily. It ends with a moist and glowy finish. My Thoughts: I decided to get the W24 shade because I tend to tan a bit in the summer times. Even if I wear sunscreen I still tan a bit, so I thought I'd get the darkest shade to try. Luckily, the shade seems to be almost a perfect match. I decided to get Etude House's Moist cushion as opposed to their regular cushion because I wanted a moisturizing cushion. My skin seems to have better luck with moisturizing cushions that have silky, or glowy, or dewy finishes. It's much picker with cushions that have matte finishes. Which is odd since I often hear the opposite for people with combo to oily skin like mine. Well, you know what they say, what works for one might not work for the other. Now that it's winter, the shade of this cushion no longer matches me. It was a bit dark even in the summer time, however, I was still able to make it work. Now though, it seems that it's a bit too dark. I wonder how light the W13 shade is. As with all my foundations, BB/CC creams, and cushion, I start by testing on my bare skin. A quick patch test to make sure I don't get any negative reactions from it. Then, I'll test it for a couple of days without any primers or concealers. I usually do this on my days off and leave it on for 12 hours each time. 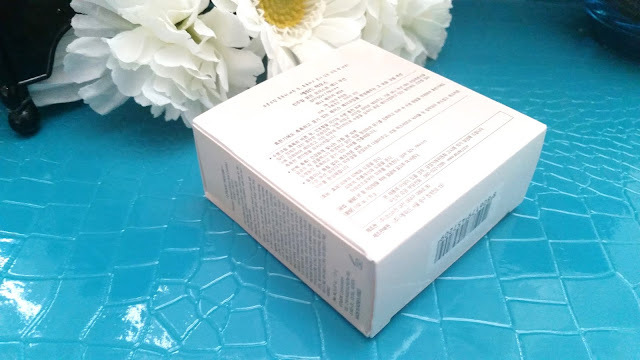 This way I can test whether it is long lasting or not, if it helps with sebum control, if it makes me look like an oil ball, if it smudges, and any other potential issues it can cause. In the past, I have found that some of my BB creams/ cushions work better if I don't use a primer, which is why I don't use a primer when I first test it out. If it seems that the cushion needs a primer, then I will try it with a primer for a couple more days. 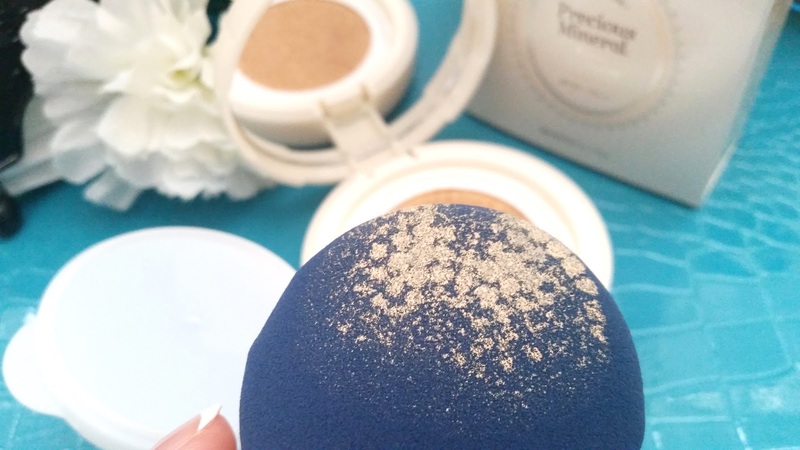 Without a primer, the Moist cushion is not really long lasting. In a 12 hours day I need to touch-up at least 1 to 2 times. The cushion product tends to slide a bit on the face after 6 hours, however, a quick touch-up can easily fix the issue. The coverage of this cushion is not superb. It was able to cover all my post acne marks, however, it was not able to cover 2 of my pimples. I'd say the coverage is light and buildable to medium. The cushion is moisturizing and feels nice on the skin. It provided just the right amount of moisture for the summer time. The cushion also provided a brightening effect when applied, which was nice. It did provide that natural glow look and it wasn't too much either. The cushion has a silky finish that isn't sticky at all. I didn't even have to use a powder on top. I found something interesting now that is winter and that is the moisturizing effect doesn't feel as awesome as it did in the summer time. It still moisturizes, however, I find myself reaching for mists more often than I would have with other moisturizing cushions. 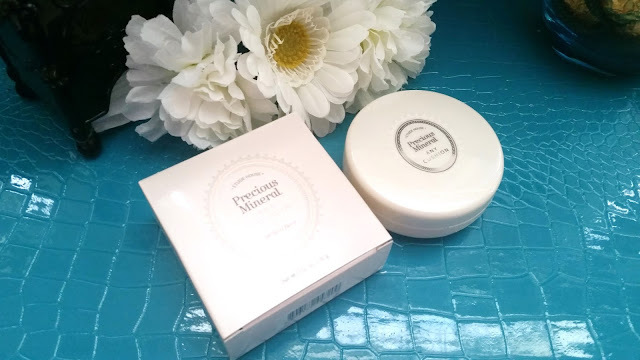 Personally, the Innisfree Ampoule Intense cushion felt more moisturizing than this Etude House Precious Mineral Moist Any Cushion. The differences weren't too noticeable during the summer time but it became more and more noticeable now that it's winter. I have to say, I liked this cushion more in the summer time than for winter. 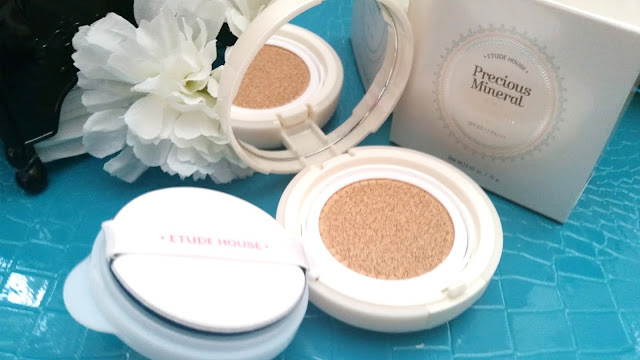 The Etude House Precious Mineral Moist Any Cushion turned out to be a cushion that needs a bit of help from a primer. I've tried it with the Benefit Porefessional primer, the Innisfree Cushion primer and the Etude House Beauty Shot Face Blur. The Benefit and Innisfree primers were able to help with control sebum a bit. All 3 of the primers were able to reduce the appearance of pores and allowing the cushion to last a bit longer on my skin. Sometimes I still needed to do at least 1 touch up during the 12 hours, but it's not too bad. 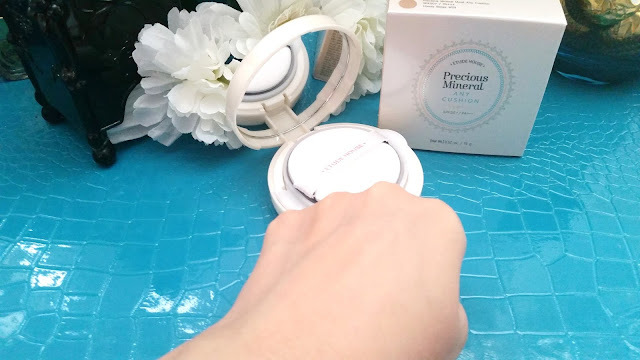 Like Innisfree's Ampoule Intense cushion, this EH Moist Any cushion can creep into the fine lines and settle there. Primers help though, so I always use one when I use this cushion. I reach for the Face Blur when I don't feel like I need sebum control, otherwise I'd stick with Benefit or Innisfree. This is because the Face Blur doesn't help with sebum control. So, it can actually hinder the how long/how well the makeup stays. Final Thoughts: This is a good cushion and I'm glad I gave it a try. I do wish the shade matched me better and that it provided more moisture for winter. I think this is a great cushion to start out with. It's fairly inexpensive and a lot of shops like Yesstyle always have sales on it, so it makes it even more worth it. Would I repurchase this in the future? I don't know. The shade is the biggest issue. It's not the best match and right now I want to find a cushion with the best match. If this cushion comes out with more shades in the future and 1 matches me well, I might come back to it. Do I think this is worth a try? Yes, if the shades matches you. I think W24 is about the same as NW25 for Mac. So, the other 2 shades (N02 and W13) are lighter and matches lighter skin tones. If the shades are a close match and the properties of this cushion are what you are looking for, then this cushion could be worth a try. Follow us on our social media platforms to see what we are up to and get the latest news on our reviews & giveaways! Disclaimer: This product was purchased by me. All opinions are honest and my own. This post contains some affiliate links, full disclaimer here.